Months of blogging silence is broken today to report on Miz Arayo's return to the water dog trials arena. For years she has been working on achieving a title which would inform the world that she is, indeed, a true Newfoundland Water Dog. But, alas, the title has remained elusive. In an interview, Arayo observed "those silly titles - they are meaningless. I know I'm a real water dog. I've rescued children who ventured too far into Puget Sound, even pulled a heavy boat to shore who's motor had clonked out. 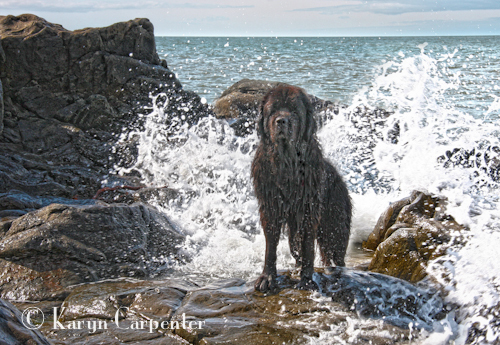 I don't need a piece of paper to prove I exemplify all the outstanding qualities of the Newfoundland breed." Asked why she continues to enter water trials, Arayo responded, "Its my human. She's flawed. She somehow has it in her head that we should drink the Koolaid and work towards that pointless title, and I humor her because it gets her out of the house and to the beach where I'm happiest. But in the end, I'm in control of this outcome and my fate." Arayo returned to her temporary home base in Southeast Kansas today after a weekend of working out with other Newfoundands and their humans in Kansas City. "I refuse to get too keyed up about this," Arayo remarked. "It's all a game, but I play it better than anyone." In a demonstration of Arayo's typical lackadaisical style, she was sent out to rescue a boat at practice today, but upon leaving the shore she spotted one of the water bugs that had been annoying everyone during the weekend. Interrupting her progress towards the boat, Arayo contemplated the bug, then proceeded to swallow it. Once that bit of housekeeping was completed, she returned to task at hand and pulled the boat to the safety of shore. To placate her slightly defective human again, Arayo is participating in two water trials in Kansas City September 1 and 2. Whether she brings home a title this time or not, she is still truly loved and appreciated. 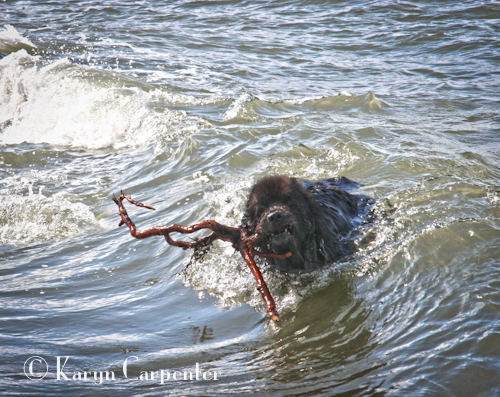 The things we Newfoundlands go through to humor our humans! All humans are flawed, Arayo - it isn't just yours.